As you all must have noticed there is a very big bike race which takes place in France every July, and has done for a number of years. Although technically it does not have the same status as the World Championships or the Olympics it is arguably far more famous and prestigious than either of them and is the one every bike racer wants to try at least once. Before the event there was a lot of hype surrounding the possibility of a British winner, following on from some impressive results from the Brits in the previous couple of years. When it began all those years ago the event mainly featured French riders but it has since grown into a major event, attracting riders from all over the world. The entry list for this year still read like a who’s who of contemporary bike racing, despite the fact that luminaries such as Sir Bradley Wiggins would not be competing. So, is it possible for a complete novice, such as myself, to compete in a race like this and hopefully make it to the finish in one piece? I know roughly what I’m doing as far as XC and Endurance mountainbiking goes but this discipline was something almost entirely new to me, well outside my comfort zone. I managed to get myself my entry, a ‘new-to-me’ bike and a ferry ticket and so off I went, wondering just exactly what I was letting myself in for. 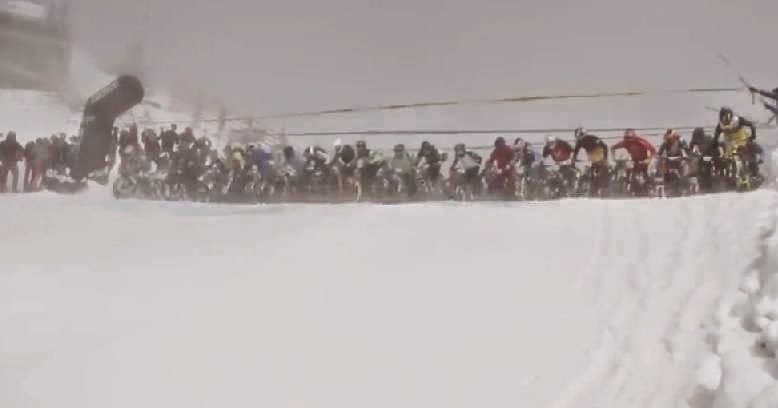 The Megavalanche itself took place at Alpe d’Huez on July 13th, Apparently there was also a road race going on somewhere at about that time but I know nothing about that. 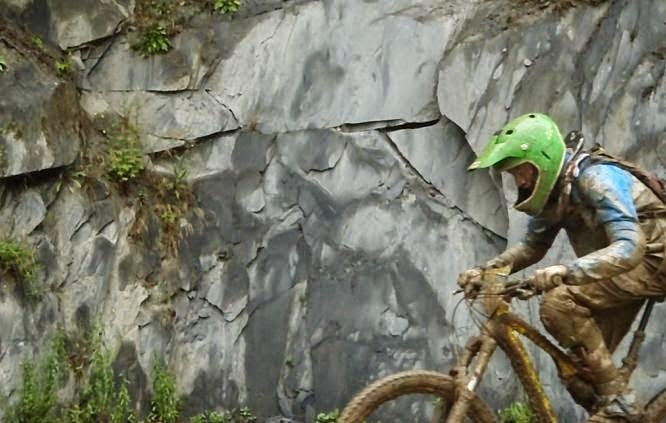 I had never done a downhill race before, and had almost exactly no experience of riding DH courses not during races, a few times down the easier ones at Innerleithen was about it. I therefore decided that the best introduction to such things would be to try the biggest and most famous races of them all and see how I got on, what could possibly go wrong? One thing which does become very obvious very quickly when driving from the ferry port in Dunkirk to Alpe d’Huez is just how big France is, it takes ages to get anywhere. I always think of France and Britain as being fairly similar, the size of population, the size of the economy, things like that, but it appears that the size of the landmass is not something they have in common. The French have about twice as much land to play with and, lucky them, the sunny bit at the bottom is mostly full of mountains. The journey to the venue took about a day and a half. This would have been a little quicker had one of the windscreen wiper blades on my van not detached itself at 80mph and disappeared over the roof. Luckily they were only on intermittent so I was able to switch them off before the stubby metal arm had punched a hole in the glass. The spray from the lorry in front of me was worse than the rain itself, but as I was on a fast dual carriageway with no hard shoulder I was unable to stop. Slowing down didn’t seem like a great plan either, there were vehicles hurtling passed me and backing off would surely have resulted in a fairly hefty rear-end collision. I tucked in behind the lorry, using his taillights to guide me, peering out as best I could. Eventually I spotted a layby and dived into it. I removed the wiper blade from the passenger side and attached it to the driver’s side. This was not as successful as I had hoped, they are surprisingly different in terms of both length and curve, but it was the best I could do. I removed the arm from the now redundant passenger side so that I could operate my one functioning wiper without smashing the windscreen to pieces and sat down for a bite to eat. I wandered over to the nearest wheelie-bin to put the wrapper in it and lifted the lid. I glanced down and saw three wiper blades at the bottom. I took them over to the van. One was about the right size and so this was installed in the time-honoured tradition with a hammer and a zip-tie. Having spent all this time fixing the wipers I was pretty much guaranteed that the rest of the journey would be dry and sunny, and so it proved to be. I had an overnight stop somewhere between Dijon and Dole, just sleeping in the back of the van at the roadside, and I reached Allemont just after 3 on Sunday afternoon. As a complete novice at this kind of thing I had purchased lift passes for the whole week, I really would need as much practice as I could get. However, my lift passes could not be collected until Monday morning and so I decided to take the road bike out for a spin instead to see what was what. Leaving Allemont I headed east along the valley floor for a couple of miles before turning and heading up the hill towards Alpe d’Huez. I know next to nothing about road cycling but the name was familiar to me from various friends who enjoy sliding around in the snow, albeit without a bike. I actually quite enjoyed the climb, despite not realising quite how long it was likely to be. I remember riding past a lovely little farmhouse with flowers in the hanging baskets outside shortly after setting off and realising that I was already about as high as the summit of Ben Nevis at that point. When I arose on Monday morning the rain was still falling steadily but eased off as I ate my breakfast. I headed up the mountain road to Alpe d’Huez, the climbing not a lot easier in the van as the ancient diesel engine struggled to pull the weight up the hill. I found what I believed to be one of the coveted camping spots underneath the main lift, DMC, which I had been reliably informed would be the centre of pretty much everything for the coming week. I joined the not insignificant queue to acquire my lift pass but by the time I had it the rain had returned with a vengeance. I was my usual unprepared self and so had to spend some considerable time sheltering under the awning of the van, doing my best to hide from the weather and keep some feeling in my fingers as I bled my brakes. With hindsight I should probably have done them in the warmth of my garage before I left. After nearly two hours of faffing around in the freezing cold I realised that it was not the rear calliper letting in the air but a small nic in the plastic pipe in the syringe. One I had identified this and fixed it I was able to complete the job in about 10 minutes. I hadn’t missed any of the practice session during this time as the main lift had been shut due to the lightning. It appears that for some reason when there is lightning in the vicinity they won’t let you climb into a metal box suspended 80ft above the ground from a series of steel pylons by steel cables, it’s health and safety gone mad. Eventually the rain eased off enough for the lifts to begin operating and so I suited up and headed for the top. As I mentioned above I have never done a downhill race before. I had only ridden my bike three or four times prior to the event and had only worn a full face helmet and body armour once before. As a complete novice I had decided that it would be best if I just padded everything I could, so in addition to the helmet and goggles I was wearing protection on my shoulders, elbows, forearms, chest, spine, kidneys, knees and shins and some pretty hefty shoes, only my hands protruding from the armour to grip the bars. The only good thing about the weather being so dire was that there was very little in the way of a queue for the lift and so I soon found myself heading for the top. The main DMC lift had two parts, imaginatively called DMC1 and DMC2. I headed for the top, DMC2, not so much admiring the view as trying to peer through the murk as best I could. We could not proceed beyond DMC2, the lift up to the summit was closed due to the weather, if high winds or fog prevent the rescue helicopter being able to fly then they have to close the upper reaches of the course. I therefore decided that the best thing to do was to have a look at the lower two thirds of the qualifying course. Leaving the relative warmth of the lift station I was glad of the protection my full face helmet and body armour offered, not from any particular danger, but from the windchill. I had been looking forward to the race for months, ever since I had entered way back in January and I was finally about to ride part of the course. I pulled my goggles down and set off down the hill. Within two minutes I was laying at the bottom of a jump saying a lot of rude words and trying to work out if I had broken anything. Having survived the rocks at the top of the course and some interesting steep sections I had arrived at the first gap-jump in that horrible no-man’s land between going fast enough to actually clear it and going too fast to be able to stop in time. Not being at all used to having my wheels off the ground I panicked, grabbed the brakes and fell of the end, slamming hard into the back of the landing. My helmet and copious amounts of armour had done their job well and once I realised that I was only winded I was able to drag myself out of the hole, and out of the way of the other riders hurtling passed. The one bit of me which wasn’t padded was of course my hands, OK two bits, but you know what I mean. My right one had swelled up considerably and seemed to have stopped bending. I was fairly sure nothing was broken though so I counted myself lucky and got back on the bike. The bike itself was completely unscathed by the whole thing, the front end had taken a huge impact with all of my weight behind it and this had had no effect on it all. The lower sections of the course were much more to my liking, a lot of fast corners, some slippery traverses and even a couple of climbing sections. Despite the size of my hand and the resulting difficulty in changing gear I arrived back at the bottom of the DMC with a huge grin on my face and a desire to do it all again, so I did. The second time I knew exactly where the gap-jump was and was very pleased to note the alternative line to the left. Discretion being the better part of valour, and cowardice being the better part of discretion I valiantly wimped out and took the chicken run. The fast section I seen the day before while out on the road bike was as much fun as it looked and, with some feeling starting to return to my hand, I was able to hold onto the bike properly and enjoy it. Alpe d’Huez was not the finish for qualifying, the route instead passed through the town, a succession of tight corners, tunnels, bridges, drainage channels, steep drops and some small jumps, luckily ones which still have ground on the far side rather than a massive hole. The first time I entered the tunnel was interesting, it’s flat out but as soon as one enters it there is a brief moment of panic where you realise that you are doing just over 20mph and can’t actually see anything, but then you are up to the corner and the light from the exit illuminates your way. Plunging down through the town the course veered off the road under the lower lift and plunged down the hillside. This reminded me very much of a helter skelter, partly because of the succession of tight corner after tight corner, but mainly because the best way down it was to hang on and hope for the best. There was a final sprint down the road to the finish line in Huez Village by the small lift with the big queue. Rather than spend an evening basking in the sunshine and drinking beer as I believe is customary for an evening at this event I instead had a hurried dinner, trying to keep the stove alight in the howling wind as best I could, and then an early night, glad to climb into the relative warmth of my van. I took a little consolation from the fact that I wasn’t one of the poor unfortunates staying in a tent, watching the water level rise ever closer to the top of the waterproof bit of the groundsheet. Tuesday morning was signalled by the display on my watch changing rather than any noticeable brightening of the sky. I opened the curtains and peered out of the van, looked at the weather and went back to sleep. It was still raining hard when I next woke up and looked. After enjoying a rare lie-in for as long as I reasonably could it became apparent that the rain was not going to stop and that I would have little choice but to get up and get wet. The worst part of this is of course putting wet kit back on. I have many shorts and jerseys but only one set of armour, one full face helmet and one pair of suitable shoes. These had all failed to dry in the van overnight, so I removed the worst of the mud and gritted my teeth as pulled it all back on. I hate wet clothes. I took the lift up to DMC2, with access to the top of the glacier again restricted due to the weather I went for another look at the qualifying course. The boardwalk section near the top which was doable yesterday was in a bit of a state with all the mud that had now been dragged across it, and grip was pretty much non-existent. It had been fairly tricky yesterday to turn on the upper section to line yourself up for the lower section and the jump at the end, today it was nigh on impossible. I saw one nasty crash, someone lost his rear wheel, overcorrected, and then slide off to the right. He bounced off the first boulder still holding on to his bike, but this then flung him upwards before he came down on the second, arms and legs flailing this time, rolled over another boulder and nearly stopped before going over the ledge. Nearly. He then fell about 10ft, landing heavily on the rocks right next to the crash mat which had been put there to protect those who fell further down the trail. Then his bike landed on him. A couple of us started climbing down towards him as he stood up, but other than a bent brake rotor he was pretty much unscathed. I had my own little incident further down, losing the back wheel on the slippery traverse below the middle lift station and rolling some considerable distance down the hill. Fortunately it was grass, on ground made soft by the rain and no harm was done. Despite the sodden and bedraggled state in which I arrived at the lower lift station I climbed aboard again and headed back to the top. I managed to attach myself to couple of other Brits who I met in the lift and set off with them. The Brits were apparently the single largest national group at the race, some 700 of the 2,200 competitors. This was good news for me as it meant that English was the official second language of the race with most communications being in two languages. I can muddle through in Italian and German but speak barely a word of French and managed absolutely fine. Below the middle lift the main race track crossed the qualifying course. At the time it seemed like a good idea to branch off and follow this, to see what we were in for in the main event. There was a bit of a fireroad climb before we entered the forest, the dense trees at last providing some shelter from the never ending rain. 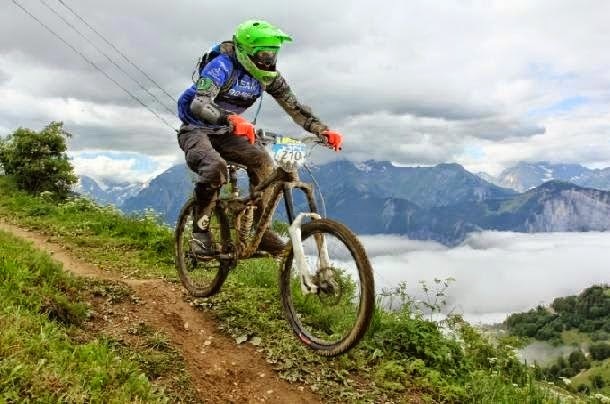 At first the mud was just slippery, I am sure you have all seen the videos from the glacier, people standing upright, holding onto the bars of their bike, skiing down on both feet as they attempt to steer. I can confirm that this is a lot less fun on mud than it is on snow, especially with a significant precipice to one's left, but we quickly changed from mud which made us go too fast to mud through which we could barely move at all. crash barriers this strong on the track! Those of you have been riding since the 90s will probably have memories of the mud from way back then. I don’t think that the mud itself was that different to the modern mud, but the lack of clearance on rigid forks and cantilever brakes encouraged it to form enormous clumps around the fork crown, wishbone and bottom bracket, preventing the wheels from turning. I hate to think how many hours I spent digging it out with various sticks. Now imagine the same effect on huge downhill bikes with disc brakes and massive mud-clearance, some of these clumps were over a foot across. Myself and one of my new companions appeared to be relatively immune to the effects. I don’t know why but we seemed to be collecting much less of it than pretty much everyone else, apart from a German guy on a little hardtail who flew past our group at the bottom of the biggest drop sideways in a shower of earth and Germanic swearwords. We could still ride, but others around us were making very, very slow progress. The wheels wouldn’t turn because of the mud, and the sheer weight of it was making the bikes nigh on impossible to carry. Progress was woefully slow, and we were all rapidly losing the will to live. When we saw the village of Oz in the valley below us, complete with a lift to return us to the summit, we did the only sensible thing and wimped out, heading down the hill and away from the horror. It may have been even colder and windier at the top but at least the bikes would move. After one more run down the middle part of the qualifying track it was time to climb into bed and attempt to restore some warmth to my frozen extremities. With the conditions being as they were on Wednesday morning there was no opportunity to get right up to the summit and practice the glacier and, after Tuesday’s traumatic experiences, little enthusiasm to ride the lower part of the race track again. As a result Wednesday was spent doing more runs down the qualifying course. To be honest this was no bad thing, I was reliably informed that this was much more difficult than the race route and I was finally starting to get the hang of my bike, it appears to be far more capable than I am, the limiting factor was definitely my bravery, or lack thereof, rather than anything do with the bike. I even managed to find one section where I was the fastest person, rather than the slowest. It was a short sharp climb only about 20 yards long but I’m still going to claim that as a victory. The main problem with practicing qualifying was getting back up from Huez village. The final section was a lot of fun, so I didn’t really like stopping at the bottom of the main lift and would carry on right down to the finishing line. The lift from there can only take five at a time, well twenty people but only five bikes and no-one seemed keen to leave their bike behind. I am told that normally one would take the opportunity to have a chat and a cup of coffee in the lift queue, enjoy the views and the sunshine, but instead we spent the time huddled under a variety of cobbled together shelters trying to keep the rain and biting wind off as best we could as we waited for the lift cars to re-emerge through the murk. There was a brief period when the downpour eased to a mere drizzle and so a small group of us decided to ride back to the top, up one of the most famous climbs of the Tour de France, on 40Lb DH bikes. This took a little longer than expected. That evening my new best friend Sam, who had become such by virtue of parking next to me, and who is not only a lot faster than me on all of the steep techy stuff but also a genius, had a brainwave. It was a proper ‘why didn’t we think of that before’ moment. We upped camp and moved into the underground car park. All of a sudden we had shelter, from the incessant rain and also from the wind. It was possible to leave the van without wearing every single item of clothing I had brought with me. We had electric lights and concrete floors. We could light a gas stove without it instantly being blown out, or occasionally over. We could even spread some wet kit out and attempt to dry it. It was even warm enough in there that we could actually bare to touch metal items such as, for example, bikes. The only slight issue was attempting to coax a Transit with a roof rack under the overhead gantries, signs, and massive gas pipe. “Max height: 2.35m”. The van is about 6’9”ish I think, plus a roof rack which is about 4”, maybe 5, I’m sure it’ll be fine, what could possibly go wrong? There were inevitably rumours circulating that evening as to what would happen to the race itself. Very few people had managed to get up onto the glacier so far, would they actually be able to start the race from there? What would happen if they couldn’t? They must have contingency plans for something like that but let’s be honest here, the glacier is the Mega, it’s the reason why so many come year after year. Could they really hold the race without it? Would they even have a choice? There wasn’t a lot less sunrise visible from inside the underground car park than there had been from outside, the concrete walls giving much the same impression as the fog had done the previous morning. I arose early, had a quick look outside at the weather and then went back to bed again. It was still raining the next time I arose and as it showed no sign of stopping I made breakfast in the relative warmth and then suited up, pulling on my not-quite-as-wet-as-it-had-been kit and heading outside. I had heard that the top part of the qualifying track was finally open and so this became the objective for the day. It was a bit of mission to get to. From the main lift station in Alpe d’Huez we went up two levels to DMC2 and then changed lifts to head down the other side of the mountain on the big lift to Oz. There was the option of riding this stage of course, but after yesterday no-one seemed especially keen on the idea. In Oz there was a short ride across the village to the other lift which took us up towards Alpette Rousses. There was a group of about 20 of waiting for the final lift as it came into view. This was not quite like the other lifts, it was more like a monorail train, it had a driver and everything. It also had a robotic platform which folded away when the carriage was ready to move, it all looked a little rickety. I’m sure it’s safe though, they must check these contraptions surely? We were slightly concerned when the driver got out and beckoned us over with the words ‘Helmets On!’ Those of us who hadn’t kept them on to ward off the cold nervously complied. The fog cleared! Very briefly. The only good thing about taking a lift up through the fog is that it hides the massive drops below our feet. We eventually reached the summit, where the lift deposited us out into a small wooden hut before turning around and heading back down the hill. It felt very much like we had been dumped on an alien world by a spaceship which had then just left us there and gone home again. The land around us was barren rock, no sign of any vegetation of any kind anywhere, just patches of snow dotted around. Visibility was minimal, 20 yards at most, when the wind blew a bit stronger and monetarily cleared some of the fog and it was noticeably colder here than it had been even at the bottom of this final lift. A couple of guys who clearly knew where they were going (we hoped!) took off down the hill to our right and the rest of us followed. There were no course marking in sight and tyre tracks were quickly being covered again by the wind and snow, this was not a place to get left behind. Once clear of the peak the mist thinned enough for us to be able to see the landscape. Not the surrounding mountains, they were still hidden by the clouds and rain, but the area we were riding through. This was truly spectacular, it looked as though it was composed of one giant rock, eroded into a multitude of interesting shapes giving lots of choice for lines to ride. This was all covered in patches of snow of various sizes, from about the size of a pool table to the size of a football pitch. Rounding a corner I spotted two people standing by the side of the track and stopped to see if they were OK. We got talking as, like every Dutchman, they spoke perfect English. They said that they had heard on the grapevine that the start of qualifying had been changed due to the weather conditions, there would be no chance of getting the rescue helicopter up to the top and so qualifying would start just above DMC2 instead. This would be a real shame, the top section had been great fun to ride. I had loved every minute of it, so much so in fact that when I reached Alpe d’Huez I immediately climbed back into the lift and headed for the top again. I knew it wouldn’t be used but there was no harm in having another go at it. The lifts had been quite a hassle, and slightly nerve-wracking despite wearing a helmet in the final one and so I decided to take what I thought would be the easy option and push the bike back up from DMC2 to the top. After an hour or so of carrying it through the snow and lifting it over the boulders I could see the summit emerging through the fog, it hadn’t been the easy option at all and I was knackered. However, I didn’t stop to admire the view and have a rest, partly because there wasn’t one, just dense fog, but mostly because it was so cold, mainly down to the quite impressive amounts of windchill. I was the only person up there the second time, and it really was a bleak and lonely place, with pretty much zero chance of being found before I froze to death if anything went wrong on the way back down, but it didn’t so that was fine. I went to check on the situation when I next got to the bottom and it was indeed confirmed that the qualifying would start on the fireroad above DMC2. Whether they would be able to start the race itself from the glacier on Pic Blanc would depend on the weather. It was not looking good. Friday was qualifying day. It was warm and sunny when we emerged from the car park and, even more unusually, not raining. We then went back inside in order to check that we were indeed awake and not dreaming. No, we were right, it had actually stopped raining! Qualifying itself would consist of 15 heats, each of 130 riders. The top 23 from each would go into the main event, 24th down to 46th places into the ‘Challengers’ race and 47th to 69th into the ‘Amateurs’. Anyone finishing 70th or lower would not be able to compete but would be allowed to ride the course after the races. The ladies would have separate heats of their own and would race on the Saturday, followed by the Challengers, with the main race and the Amateurs racing on Sunday morning. I have no idea how the numbers had been allocated, as far as we could tell it was more or less done at random. However, I was not complaining, I had been given Number 210 and this meant a front row spot in the second heat. The decision to move the start of the qualifying had been taken on the Thursday. Looking at the weather conditions up there on Friday morning I think that it would have been possible to start it from the top, but it would have been pretty near impossible to get everything set up the night before, and of course the weather could not have been guaranteed. I headed up to the top nice and early and was in plenty of time to watch the first heat assemble and then depart. The atmosphere up there was electric, I don’t know how many races I have done over the years, literally hundreds, but this was something special. The second heat were called forward a row at a time to take their positions, I got a spot over on the right hand side, being on one side in any race is always the favoured position, too much can go wrong starting in the centre. The only downside with being over there was that I was starting on quite a lose surface, I used the wait between the heats to clear a few of the larger rocks out of my way and got ready for the off. I'm not sure which causes which but they seem to occur together. I am sure that you will all know exactly what I am talking about when I refer to that music, we have heard it so many times before. However, hearing it standing on the top of the mountain, on the front row of the grid with 129 riders behind you all fired up and ready to go is a feeling which is very hard to describe, and so I won’t. If you haven’t been there and done it you should. The music peaked, the tape lifted and we all shot off like the proverbial from the shovel. Well, not quite all of us. I wasted my front row advantage in a hail of stones and wheelspin. This actually turned out to be rather a good thing. Those who had got a better start all barrelled into the first turn at quite a significant speed and immediately collected each other in a tangle of flailing limbs and cartwheeling bikes. I was far enough back to see this happening and take avoiding action around the right hand side. Those of us who had survived the first corner unscathed encountered another bottleneck a little further along, someone got it wrong in the snow and everyone else behind them came to a stop, I leapt off and ran before remounting and sprinting down the hill towards the lift station. The track narrowed significantly as we plunged down the mountainside and we were into the techy rocky singletrack which is so much fun. There was another bottleneck at the boardwalk section, which I expected. A number of people had been struggling here in practice, the lack of grip on the wooden sections causing all kinds of problems, and so it was no surprise to see so many having difficulties in the race. I had foreseen this and planned my lines accordingly. I rounded the turn and dived left into the drainage channel, sliding down over the rocks. This missed out the top section of the boardwalk where braking to line oneself up for the second section had been such a problem, and meant that I joined it on the little flat bit between the two sections. There was some shouting behind me as I obviously got in someone’s way doing this, but then I was down, off the jump at the end, landing nicely on the downward slope and leaning into the next corner, the tyres biting into the dirt, absolutely perfect. I stopped briefly to put my chain back on and then set off again. The fireroad and little rocky climb up to the lower lift were both fine. Ever better the traverse below it had dried out considerably, so much so that it was now possible to steer on it, a big improvement over the previous few days. The one section of the track which I seemed able to do better than most I also struggled on today as my chain came off again on the preceding descent, forcing me to run up the climb and over the little bridge. I paused at the top to put it back on again and resumed my chase of those in front. The section along the side of the road had also dried out and was rolling pretty fast, there were a lot of spectators here as it was quite simple to get to. We plunged down through the town of Alpe d’Huez, a lovely little section riding through drainage channels, tunnels, bridges and jumps, people out in force here to cheer us on. The helter-skelter section caused a few interesting moments, the very bottom had been changed slightly from practice; in order to slow us we entered the last tunnel two new chicanes had been added. These took us all by surprise as we hurtled into these new corners far too fast and outbraked ourselves. The guy behind me had obviously seen what I was doing and had a little more warning, he emerged from the tunnel right on my wheel, heading for the final drop-off. I went left, he went right. Our handlebars touched in mid-air, we landed together, bumped shoulders again and both sprinted for the corner. He just got it, and I sprinted down the road after him and across the finish line. As mentioned above, only the 69 fastest riders from each heat would actually get to race. I knew my time, but not my position. It was a long wait to find out if I had done enough. There were also rumours circulating that the forecast for the following day was looking a bit grim to say the least. It was therefore looking likely that the ladies, the Challengers, and half of the non-qualifiers would not get to start on the glacier at all. Sunday’s starts were by no means guaranteed either, we wouldn’t find out until at least tomorrow. After I’d had a bite to eat the results were posted. 65th, I was in a race. Job done. But would I actually get to do it on the glacier? To repeat myself, the glacier really is the Mega, the reason for being here, it was a long way to come not to do it. I had done my bit, it was now up to the weather gods. We didn’t entirely trust these gods and so upped camp and moved down the valley to Allemont, being several thousand feet lower down would hopefully make quite a difference to the ambient temperature and we would be in the perfect position to watch the end of the Saturday races. After a brief respite from the atrocious conditions for Friday qualifying normal service had been resumed for Saturday. We had moved camp down to Allemont but even this much lower down it was still cold and miserable. I eventually dragged myself from my bed and out into the cold and went to watch the finish of the women’s race, Melanie Pugin (France) taking the win from Meggie Bichard (New Zealand) and Manon Carpenter (UK). I then headed into town for breakfast, mainly so that I could sit in a bakery and try to get warm again. When I returned there were a lot more people there, and what a sorry sight they looked. There was mud everywhere, everyone was a uniform shade of brown from head to toe, making it rather difficult to tell who was who. The bikes which were coming across the line were so clogged with mud that the wheels would barely turn. There was a huge queue for the bike wash and the stream was full of people trying to get rid of the worst of it from themselves. A significant number of people were arriving with parts missing from their bikes, mainly chains and rear mech, but also spokes, tyres and various other bits. This bike belongs to a New Zealander, who’s name I have forgotten. I decided to wander up the track to see exactly what I was in for tomorrow. I crossed a river and then headed up the hill. This turned out to be quite a major undertaking, it was pretty much impossible to stand on it, never mind walk, and I ended up in the undergrowth on the left dragging myself up with my hands. I saw a huge crash here, someone came barrelling into the top section at about Warp Speed 3, lost the back end of the bike and veered off the track to his left, my right. Myself and another guy were about 50 yards from him but clearly heard the sound of helmet on tree. He didn’t move. We somehow found some extra speed and headed for him as fast as we could. He was still conscious and, although quite dazed, seemed to be unhurt. He was still also clipped into his bike, which we managed to remove from him. He got to his feet very unsteadily looking a little like a drunk trying to stand and then, once we had reminded him which way he was supposed to be going, slid off down the hill towards the finish. I continued up the hill. The next big crash I saw the person concerned remarkably got away with it. A steep right hand turn lead into a steep left, dropping down over some tree roots, polished smooth by the riders who had already been across them. He made the right turn OK, but lost his back wheel on the roots which sent him left and over the edge of the cliff. I am not exaggerating here, the cliff must have been 30-40ft high. It’s difficult to be precise as the bottom was largely hidden by the trees and undergrowth. These appear to have saved him from serious injury, slowing his fall as he crashed through them. This was a very good question. We could see the broken undergrowth where he had gone, but nothing beyond that, as far as we could tell it was pretty much vertical, practically impossible to climb at the best of times, never mind in full armour and carrying a 40lb DH bike. A discussion ensued of the likely options, but in the absence of a rope they were all abandoned. We could just about see the river behind him so directed him to go that way and then wade along it to his right until he crossed the track further down. I’m sure he wouldn’t be penalised for missing part of the course in the circumstances. As he was unhurt we just left him to it, we could hear him for quite some time fighting his was through the ferns and brambles. We remained there a while longer, shouting encouragement and a warning as the last of the non-qualifiers made their way down one by one in various bedraggled states and with their bikes in various states of disrepair. The official announcement as to what would happen on Sunday would be made at 7:30. Would I actually get to ride the glacier? The notice went up in the main arena in Alpe d’Huez. The start of both races would be one hour later than scheduled. The main race would start on the glacier and finish in Allemont. The Amateurs (me) would start from the glacier, but would finish in Alpe d’Huez, as would the non-qualifiers who rode the course after us. All subject to a final weather check in the morning of course. Perfect, I get to do all the fun bit, without the horrible muddy section below the town. Much to everyone’s surprise Sunday morning dawned bright and sunny, or at least less bad than of late. I took the main lift up to DMC2 at 8:30, and then the cable-car from there up to the summit of Pic Blanc, at 10,800ft. The first time I ever saw the glacier was when I took my position at the back of the grid. Talking to those around me I gathered that almost all were in the same boat, most of us had been unable to get up to the summit during practice. There was a sea of 400 odd riders, some odder than others, stretching out in front of me beyond which I could see the ice just disappearing over the crest and into the fog. I had no idea what lay beyond. I was about to ride down the glacier blind and with 400 other nutters, what could possibly go wrong? This really is as much as I had seen of the glacier before I rode it. The music was playing, it reached it’s peak, the tape lifted and amid much shouting and bravado we hurled ourselves into the unknown. I would like to say a very big thank-you to loads of people, far too many to list, but I will mention Sam Acland for helping out so many times during the week and especially for being the genius who thought of the underground car park. All of the lightweight Mt Zoom bits on my bike somehow survived a week of DH racing by a complete novice, not at all what they were designed for, but they all proved more than strong enough. Accelerade kept me fed and watered throughout.